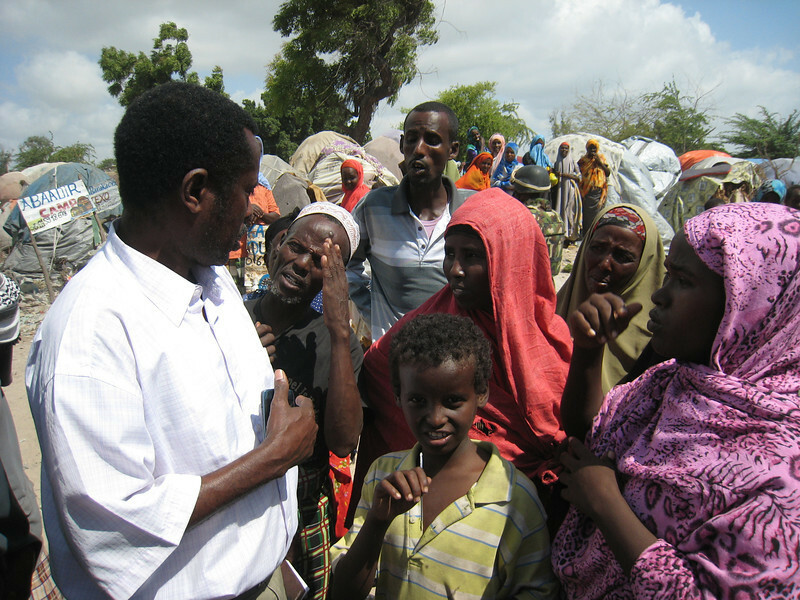 5 December 2011: OCHA Humanitarian Affairs Officer Ahmed Farah Roble and UNHCR staff see first-hand the conditions at an IDP settlement in Mogadishu, Somalia. 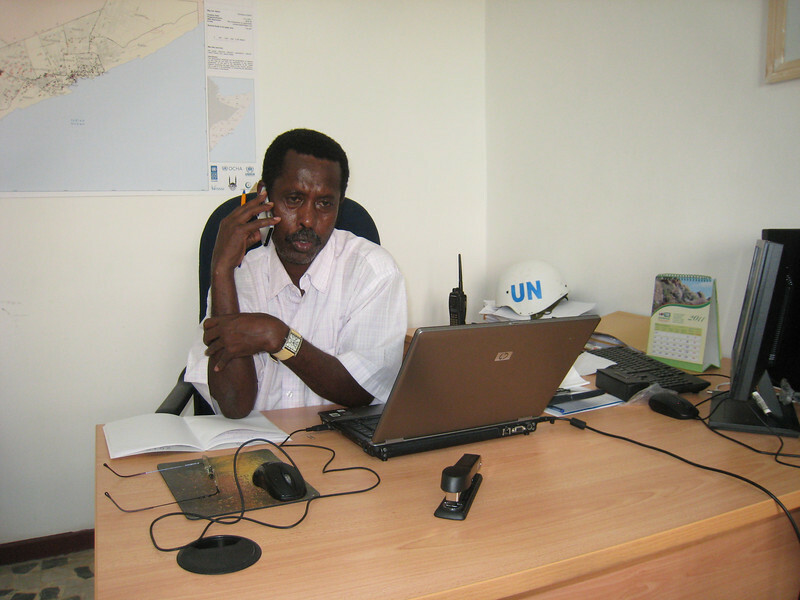 Ahmed Farah Roble is the UN’s longest serving humanitarian officer in the Somali capital, but he is still personally affected by the plight of people struggling to survive conflict and famine. It’s a hot, dusty morning in Mogadishu, the war-ravaged capital of Somalia, and Ahmed Farah Roble is in a makeshift settlement for internally displaced persons (IDPs), listening to a mother tell him about her baby daughter. Ahmed nods patiently, asks questions and listens attentively. He’s in the camp to meet with its representatives, to learn more about their situation. Many have recently arrived from the country’s south, fleeing hunger and conflict. They have very little – and urgently need food and medicine, shelter and health care. It’s hard not to be affected by what he sees and hears - especially as the 45-year-old was born and raised in Mogadishu. As the longest-serving UN humanitarian affairs officer in the capital, Ahmed has heard many similar heart-breaking tales before. “But it is painful, still. I can say that, before, this was a peaceful city. It was paradise. Now, these people living here have lost everything, their property, opportunities for education. There are not enough health services. There is no safe drinking water in some areas,” he says. 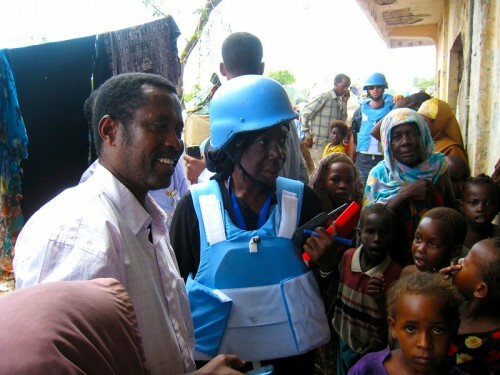 For much of the past four years, through some of Mogadishu’s heaviest fighting, he was the lone man on the ground for the UN Office for the Coordination of Humanitarian Affairs (OCHA) – the part of the UN responsible for bringing together humanitarian groups to ensure a coherent response to emergencies. The fighting was so severe and the situation so dangerous that, until recently, OCHA was unable to deploy more staff to join him. National staff members like Ahmed make up more than 90 per cent of humanitarian workers around the world, working on the frontlines. Too often, they bear the brunt of violence. The dangers of working in Somalia, and restricted access for internationals, have led to a greater reliance on national staff, as well as local partners. Ahmed’s family is in a neighbouring country for safety. For much of the time that he’s been in Mogadishu, the city has been riven by a fluid frontline dividing the two sides – fighters belonging to the Al Shabaab movement and troops belonging to the Transitional Federal Government (TFG). The TFG is supported by the peacekeeping forces of the UN-backed African Union Mission in Somalia (AMISOM). The violence worsened the already-dire humanitarian situation for the city’s existing residents, as well as the many new people who sought help and refuge there after famine struck parts of the south in mid-2011. Since Al Shabaab’s withdrawal from the central parts of Mogadishu in August, the frontlines have been pushed back to the city’s outskirts – but the situation is still far from secure. The use of roadside bombs, grenades and suicide bombers is a regular occurrence, and on the rise. Outbreaks of fighting still take place regularly. In early December, the city experienced some of the fiercest fighting in more than three months, as Al Shabaab forces attacked TFG troops. Heading back to his car to make his way to the OCHA sub-office is no easy feat. IDPs try to grab his attention with every step. Finally back at his desk, now populated with two new national colleagues and three international colleagues, Ahmed starts preparing a report of what he has heard and seen during his visit. The report will inform OCHA and its partners about the humanitarian needs of that IDP settlement, allowing the humanitarian system to direct essential aid to its residents. Ahmed smiles when he hears of Marcel’s words later in the day. He says he doesn’t have much time to discuss them as he has to finish his report ahead of a meeting. While he appreciates the comments, he is motivated by a deeper purpose. His eyes go back to his keyboard and he starts typing.